Two years after earning an Academy Award nomination, a hunting accident left actress Susan Peters paralyzed from the waist down. She later starred in a daily NBC soap opera called Miss Susan, which ran for nine months during 1951. Peters died less than a year after the show went off the air. In late September 1940, at the age of 19, Suzanne Carnahan fainted while filming her first scene in front of a camera . It was for an uncredited role in Always a Bride (released in November of 1940), starring Rosemary Lane and George Reeves. The actress, under contract to Warner Bros., would make a variety of uncredited appearances, bit parts and small roles during 1940 and 1941, in such films as Money and the Woman, Santa Fe Trail, Meet John Doe and Three Sons o’ Guns. She soon took the stage name Susan Peters, was dropped by Warner Bros., signed by MGM, and before long began getting more substantial work in films like Tish and The Big Shot. For her role in 1942’s Random Harvest, Peters received an Academy Award nomination for Best Actress in a Supporting Role (the film, which was nominated for seven nominations, won none). That same year, Peters had a small role in Andy Hardy’s Double Life as Sue, Wainwright Coed on Train. In November of 1943, Peters married actor Richard Quine; the two had worked together on Tish, and Dr. Gillespie’s New Assistant. In early December, Peters’ mother died of a heart attack . In April of 1946, Peters and her husband adopted an 11-day-old baby . The following month, she was able to drive a specially-outfitted car for the first time since her accident, and picked up her surprised husband at the airport . MGM kept Peters on its payroll for six months after her accident; she later asked to be let out of her contract to allow her profit participation in future films . In March of 1947, Peters told The Los Angeles Times that she would be making a movie later that year but that her only interest in acting was to pay her medical bills and to allow her to adopt additional children . The film, Sign of the Ram, was based on a novel by Margaret Ferguson, and was the first script Peters felt gave a logical reason for its heroine to be in a wheelchair . Hedda Hopper reported that a special $450 wheelchair was being built for Peters, with special slip covers to match the gowns she would wear in the film . Peters drove herself to the studio on July 16th for her first day back at work, where she was met by the likes of Ginger Rogers, Glenn Ford and Alexander Knox (her co-star in The Sign of the Ram) . The film opened in March of 1948. Reviews were kind to Peters but not to the film overall. Bosley Crowther of The New York Times wrote that the “fortitude of Susan Peters in returning to the screen after a cruelly crippling accident suffered three years ago, is worthy of a more substantial token of respect than it–and-she–receives in ‘The Sign of the Ram'” . The Chicago Daily Tribune‘s Mae Tinee called it “the old story of the mean, mean woman” but felt “Miss Peters manages to make it fairly palatable” . Edwin Schallert, reviewing the film for The Los Angeles Times, wrote that “while the assignment is notable in calling on her powers as an actress, when one considers the actual circumstances, he inherently rebels against the unkind fate that besets Miss Peters in this film which marks her return, even though she herself doubtless favored the role” . Only months after The Sign of the Ram opened, Peters and Robert Quine separated. Quine confirmed the separation to the Associated Press, explaining that his wife had repeatedly stated “she is happier alone” . Their divorce was finalized in September . A little more than a year after her return to film in The Sign of the Ram, Peters made her stage debut, playing Laura in a summer stock production of Tennessee Williams’s The Glass Menagerie. The play opened at the Norwich Summer Theatre in Connecticut on June 27th, 1949 . According to The New York Times, Tennessee Williams allowed the play to be altered so that Peters could portray Laura from her wheelchair . Peters later played Elizabeth Moulton-Barrett in The Barretts of Wimpole Street, alternately sitting or reclining on a couch; she continued in that role through February of 1951 . Even as Peters was appearing on stage, work was underway on a television soap opera for her to star in on the small screen. The program, titled Miss Susan, was one of several planned soap operas for television that would “spread sweetness and light and an optimistic philosophy” while shying away from the more over-the-top storylines found on radio soap operas . According to a December 16th, 1950 article in The Billboard, Miss Susan would be “a tale of the heroic try of a gal to make her way despite being confined to a wheel chair, paralleling the saga of Miss Peters herself” . In early January of 1951, Colgate-Palmolive-Peet took an option out on Miss Susan, for use in the 3-3:15PM timeslot on NBC where it would replace The Ransom Sherman Show. According to The Billboard, NBC had filmed a test for the series, with scriptwriter Carl Bixby and talent agent Ted Ashley involved . The series would be filmed in Philadelphia due to a shortage of television studios in New York City . However, in early February, The Billboard called Colgate’s option a “tentative commitment,” suggesting it was not yet a done deal . Plans were shored up within a few weeks, with production to take place at WPTZ in Philadelphia and a March 5th premiere date set . Philadelphia was ultimately chosen over other possible locations but even it was not ideal; for starters, the Screen Actors Guild only had agreements in place for television productions taking place in New York City, Chicago or Los Angeles . Scriptwriter William Kendall Clarke was soon brought on board to pen the series . On February 18th, 1951, The New York Times reported that Miss Susan would be premiering on March 5th, bringing news of the soap opera to those outside the television industry . In a United Press interview published a few days before the series was set to debut, Peters explained that she would be playing “a woman lawyer who was injured in an automobile accident” but promised “it won’t be one of those tearful serials” . According to The Chicago Daily Tribune, Miss Susan was “inspired by real life experiences” . On March 4th, The New York Times reported that Susan Peters had a throat infection and would be unable to start Miss Susan the following day as planned; the premiere was pushed to March 12th . WPTZ, the NBC affiliate in Philadelphia where Miss Susan would originate, reported that she had laryngitis and a heavy cold and was under orders to stay in bed for a week . Peters recovered and Miss Susan premiered on Monday, March 12th at 3PM. The delayed premiere of Miss Susan did not go off without a hitch. According to the the Daily Boston Globe, viewers were mystified when “unseen actors spoke obviously irrelevant lines during the introductory moments” of the episode, lines that came from a rehearsal of “Young in Heart” . During the course of the first episode, young attorney Susan Martin (played by Susan Peters) leaves her city job to return home to Martinsville, Ohio, where she learns that her family’s beloved retainer, Laura Monroe (played by Helen Ray), has been accused of stealing jewelry. Left paralyzed following a car accident, Susan has a nurse/companion, Daisy (played by Natalie Priest), who travels with her. Susan’s primary love interest was another young lawyer named Bill Carter (played by Mark Roberts). Other characters included housekeeper Mrs. Peck (played by Katheryn Grill) and Bruce Landon (played by Robert Courtleigh), a reporter for the town’s paper, The Clarion. There were also two characters related to Susan: Sam Martin (played by Don Hanmer), whose exact relationship is unknown, and young Chris Martin (played by Ralph Robertson), who was her nephew. Susan’s late father had been a lawyer as well and his former law partner, John Croft (played by Joseph Foley) may have been Bill Carter’s boss. Duke Andrews, one of the characters convicted of murder, was a private investigator who killed Andrea Blake, the mistress of Henry Benson (whose daughter, Joan, married Bill). Why Susan married Bruce rather than Bill, who was established as her love interest, is a mystery, but it could have something to do with Susan being unable to have children. The wedding took place during the first or second week of October . Also, Susan’s former employer, Roger Nystrom (played by Robert McQueeney) was in love with her, and apparently followed her to Martinsville, but exactly how he fit into the series is unknown. The town Miss Susan was set in — Martinsville, Ohio — was fictional. For the purposes of location shooting, Hadonsville, New Jersey filled in for Martinsville, with street signs changed while filming was underway. However, the city only allowed television crews to shoot between 7-8AM to avoid disrupting traffic . R. F. McPartlin, writing for Daily Boston Globe, suggested after viewing the first episode that Miss Susan “gives promise of being either a thriller or a heartbreaker–maybe a combination of the two” . June Bundy gave the first few episodes a horrible review in The Billboard, writing that “Miss Susan has nothing to offer beyond the personal magnetism of its star,” blaming weak production values and scripts for the “leaden pace” of the series. She ended her review by pointing out that “Colgate’s animated cartoons for Fab and Ajax Cleanser seemed more sprightly than usual, when contrasted with the show’s static pacing” . As for Susan Peters, she enjoyed working on the series, telling Joan King Flynn of The Milwaukee Sentinel “I like the part of ‘Miss Susan’ and her story as the helpful advisor. ‘Miss Susan’ is sympathetic, very warm, human and understanding, and that’s the way I like to think I am. Another thing, ‘Miss Susan’ is never bitter–and I hope that’s the way I am, too” . On April 28th, The Billboard reported that William Kendell Clarke had finished as “scripter on the Susan Peters video soaper” and was returning to freelance work . A week later, however, it was reported that Jean Sargent was “doing script chores” on Miss Susan for WPTZ . Whether she was writing additional scripts or revising those Clarke had worked on is unknown. In mid-June, writers were hard at work again after Susan Peters came down with the measles (she got it from her son) and her character had to be written out of a week’s worth of episodes . In mid-September, after six months on the air, The Billboard reported that NBC would soon be the new home of both the radio and television versions of Strike It Rich, sponsored by Colgate, after obtaining the rights to the programs from CBS, which had aired the half-hour television version from 11:30AM-12PM daily (sustaining on Tue/Thu) . It was believed that NBC would schedule the series daily from 3-3:30PM, meaning Miss Susan would be canceled. Colgate had been looking for a property it could use to fill the 3:15-3:30PM time slot and Susan Peters had been in poor health, so the proposed cancellation was likely not a surprise . Meanwhile, NBC had included Miss Susan on its list of television programs to be scheduled coast-to-coast following the September 29th introduction of regular programming over AT&T’s new transcontinental relay. Beginning with the Monday, October 1st episode, Miss Susan would be seen live on NBC stations across the country rather than just its East-Midwest network . On September 29th, The Billboard reported that Colgate planned to move Miss Susan to an earlier hour to allow Strike It Rich to occupy the 3-3:30PM half-hour, suggesting talk of cancellation was premature . By early December, Colgate executives were struggling to decide whether to sponsor The Big Payoff (a game show hosted by Bess Myerson) or The Cowan Show (a revue series starring Jan Murray and others), and whether to give the selected show the 3-3:30PM half-hour on NBC or the 11:30AM-12PM half-hour on CBS. Either way, Miss Susan was “almost sure to be axed,” because the 3-3:30PM half-hour on NBC would go to Strike It Rich in the event one of the aforementioned shows went to CBS . On December 29th, The Billboard reported that Colgate had made its decision and would be slotting The Big Payoff from 3-3:30PM daily beginning December 31st, while Strike It Rich would air Mon/Wed/Fri from 11:30AM-12PM. As for Miss Susan, it aired its last episode on Friday, December 28th . Exactly how much of an influence Miss Susan‘s ratings had on its cancellation is uncertain. Had the ratings been high enough to warrant continuing the series, the health problems of star Susan Peters would likely have ended the series anyway. The only indication that the series was a success is an October 22nd advertisement in Broadcasting*Telecasting heralding the fact that Miss Susan “is making sales–and is reaching viewers at a lower cost per thousand than any other five-time-a-week, daytime dramatic show” . On Thursday, October 23rd, 1952, Susan Peters passed away at the age of 31 due to complications from the gunshot wound that left her paralyzed more than seven years earlier. According to a United Press article, her physician gave the primary cause of her death as kidney failure but also explained she “wouldn’t allow anyone to help her recently” and “had lost the will to live” . Peters was buried at Forest Lawn Memorial-Park in Los Angeles on October 27th . She left her estate to Richard Quine, her ex-husband . On June 10th, 1989, Quine committed suicide at the age of 68 . 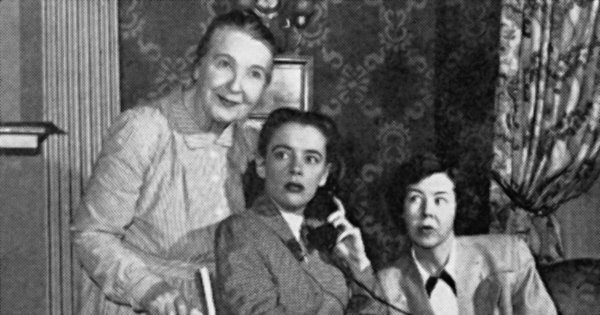 Of the estimated 210 episodes of Miss Susan believed to have been broadcast live (based solely on a calculation of weekdays between Monday, March 12th, 1951 and Friday, December 28th, 1951), only two are known to exist, the Tuesday, July 3rd and Friday, August 24th episodes, which are held by The Paley Center for Media. Credits for these episodes include Ken Buckridge as director/producer and Ellis Marcus as writer. A handful of sources indicate that Miss Susan was retitled Martinsville, U.S.A. at some point during its nine-month run . No contemporary accounts of Miss Susan being renamed Martinsville, U.S.A. have been found. In The Daytime Serials of Television, 1946-1960, Jim Cox suggests the new name was part of a broader attempt to revamp the show following charges that Susan Peters was being exploited . 1 “Starlet Has ‘Jitters. '” Los Angeles Times. 29 Sep. 1940: C2. 2 “Susan Peters Wounded.” United Press. New York Times. 2 Jan. 1945: 21. 3 “Actress Better after Removal of .22 Bullet.” Associated Press. Chicago Daily Tribune. 3 Jan. 1945: 2. 4 “Susan Peters is Paralyzed.” Associated Press. New York Times. 9 Jan. 1945: 16. 5 Schallert, Edwin. “Future Brightens for Susan Peters.” Los Angeles Times. 5 Aug. 1945: C1. 6 “Actress Susan Peters’ Mother, Niece of Robert E. Lee, Dies.” Los Angeles Times. 6 Dec. 1945: 6. 7 “Film Couple Adopt Son 11 Days Old.” Los Angeles Times. 19 Apr. 1946: A1. 8 “Susan Peters Again Able to Operate Auto.” Los Angeles Times. 5 May 1945: A1. 9 “Brady, Thomas F. “Hollywood Digest.” New York Times. 10 Aug. 1947: X3. 10 “Actress Susan Peters’ Hopes Top Misfortune.” Los Angeles Times. 23 Mar. 1947: 3. 11 Scheuer, Philip K. “Wheel Chair Film-Making Deal Thrills Susan Peters.” Los Angeles Times. 6 Jul. 1947: C1. 12 Hopper, Hedda. “Looking at Hollywood.” Los Angeles Times. 24 Jun. 1947: A3. 13 “Paralyzed Film Actress Back at Work in Studio.” Chicago Daily Tribune. 17 Jul. 1947: 15. 14 Crowther, Bosley. “‘The Sign of the Ram,’ Marking Return of Susan Peters to Films, at Loew’s State.” New York Times. 4 Mar. 1948: 30. 15 Tinee, Mae. “‘Sign of Ram’ Brings Back Susan Peters.” Chicago Daily Tribune. 12 Mar. 1948: A6. 16 Schallert, Edwin. “Susan Peters Returns in Sinister Role.” Los Angeles Times. 20 Feb. 1948: 18. 17 “Susan Peters, Mate Separate, ‘Couldn’t Live Up to Ideal’.” Associated Press. Chicago Daily Tribune. 4 May 1948: A5. 18 “Susan Peters Wins Divorce from Quine.” Los Angeles Times. 11 Sep. 1948: 3. 19 “Susan Peters in Play.” United Press. New York Times. 27 Jun. 1949: 18. 21 Schallert, Edwin. “Strong ‘Barretts’ Opens New Ivar.” Los Angeles Times. 6 Feb. 1951: B6. 22 “Gone’s The Agony on TV: Sweetness Rules Roles on Video’s Batch of Soapers.” The Billboard. 16 Dec. 1950: 6. 24 “Susan Peters Show Optional By Colgate Co.” The Billboard. 20 Jan. 1951: 3. 26 “Soap Firms Moving Into TV In Parallel to Radio Buys.” The Billboard. 3 Feb. 1951: 4. 27 “No Studio Facilities in New York; NBC Skeds TV Weeper From Philly.” The Billboard. 17 Feb. 1951: 6. 29 “Short Scannings.” The Billboard. 17 Feb. 1951: 7. 30 Lohman, Sidney. “News and Notes from the Studios.” New York Times. 18 Feb. 1951: 89. 31 Toomey, Elizabeth. “Susan Peters Has Overcome Great Handicap.” United Press. Tuscaloosa News. 2 Mar. 1951: 5. 32 “Harry Sosnick Triple Threat Man in Video.” Chicago Daily Tribune. 3 Mar. 1951. 33 “Susan Peters, Ill, TV Show Off.” New York Times. 4 Mar. 1951. 34 “Radio and Television Notes.” New York Times. 5 Mar. 1951. 35 McPartlin, R.F. “TV Diary: Four of a Kind.” Daily Boston Glove. 13 Mar. 1951: 12. 36 Remenih, Anton. “Television News and Notes.” Chicago Daily Tribune. 4 Dec. 1951: B10. 37 Woltors, Larry. “TV Soap Opera Queen Weds in 6 Brief Months.” Chicago Daily Tribune. 15 Oct. 1951: C2. 38 Steinhauser, Si. “Radio and Television News & Views: Television Seeks Own ‘Czar’ In Effort to Balk Censors.” Pittsburgh Press. 5 Aug. 1951: 70. 40 Bundy, June. “Television-Radio Reviews: Miss Susan.” The Billboard. 31 Mar. 1951: 13. 41 Flynn, Joan King. “TV’s Indomnitable ‘Miss Susan’.” The American Weekly (Insert). 21 Oct. 1951: 29. 42 “Short Scannings.” The Billboard. 28 Apr. 1951: 11. 43 “Short Scannings.” The Billboard. 5 May 1951: 7. 44 Sullivan, Elizabeth L. “Confirmation Service for Jewish Boy on TV.” Daily Boston Globe. 24 Jun. 1951: A9. 45 “Colgate’s AM-TV ‘Strike’ Goes from CBS to NBC.” The Billboard. 22 Sep. 1951: 4. 47 “Cross-Country: CBS ‘Freedom Rally’ First.” Broadcasting*Telecasting. 24 Sep. 1951: 72. 48 “CBS Loses TV ‘Strike it Rich’; Mulls Alternate.” The Billboard. 29 Sep. 1951: 8. 49 “Line Forms at Center: Packagers, Agencies, Nets, 2 Each, in Act.” The Billboard. 1 Dec. 1951: 10. 50 “NBC Forced Into Daytime Video Program Shake-Up.” The Billboard 29 Dec. 1951: 6. 51 [Advertisement]. “Is your advertising agency prepared to put you on TELEVISION…at a profit?” Broadcasting*Telecasting. 22 Oct. 1951: 68. 52 “Susan Peters Dies; ‘Lost Will to Love’.” United Press. New York Times. 25 Oct. 1952: 17. 53 “Private Burial Set Here for Actress Susan Peters.” Los Angeles Times. 26 Oct. 1952: B1. 54 “Susan Peters’ Estate Left to Former Husband.” Los Angeles Times. 9 Dec. 1952: 16. 55 “Richard Quine, 68, Actor Who Directed ‘Murder Your Wife’.” New York Times. 14 Jun. 1989. 56 One source is The Soap Opera Encyclopedia (Christopher Schemering, 2nd ed. New York: Ballantine Books, 1988: 162). The Internet Movie Database and The Paley Center for Media also states that the series was renamed Martinsville, U.S.A.
57 Cox, Jim. The Daytime Serials of Television: 1946-1960. Jefferson, N.C.: McFarland, 2006: 32. 1 From TV News (Western New York TV NEWS, Inc.) April 21st, 1951, Page 4. This is fascinating information on triumph and tragedy, etc.. The series Susan was in should have been preserved and remastered, even if just for historical purposes. Carelessness with firearms is so destructive… such a shame to damage her career and life. I can only wonder if the lead and/or salts that accompany lead poisoning might have injured her kidney unless the sedentary lifestyle contributed to it, but it is odd that she and her mother suffered so much bad luck, like her mother having the heart attack following the accident, etc.. I hope you can locate where the film series is. Thanks for this. In the last picture above, I’m pretty sure the first “Unidentified”, the one standing holding the cigar, is Will Wright (1894-1962) who made a career of playing vinegary old men in hundreds of movies and TV series from Blondie Plays Cupid in 1940 to a recurring role as storekeeper Ben Weaver on The Andy Griffith Show. Jim, I think you’re right. I haven’t found any reference to Will Wright being in Miss Susan but that sure looks like him. It could have been a guest spot or a recurring role or even a regular role. There’s just no way to know. Yes that is defiantly Will Wright in that photo.